By Patti Haddick, Director of Home Services – The holidays are stressful for any adult but when you add the stress of caring for a loved one, it can be overwhelming. There are decorations to put up, cookies to bake, gifts to buy, and if you add taking care of a frail loved one, it seems unmanageable. Even looking for ways to redistribute the responsibilities is just one more cause for stress in a caregiver’s life. After wearing the hat of being a caregiver for my mother in her final years, I can now see how much stress I was under. 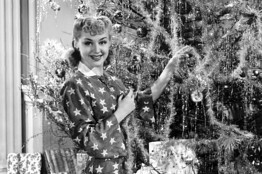 But I was hesitant to give it up since I had always baked the pies for Thanksgiving, tried to put some thought into the Christmas presents I was buying, picked out and decorated a real tree every year, and on and on. Looking back I see how unrealistic these expectations were and that I was the one causing my own overabundance of stress during the holidays. The last couple of years I realized that my expectations of the holidays were making me crazy, so I made some changes. I no longer made several types of cookies. I baked chocolate chip for my son and my mother and oatmeal for myself and as a gift for my cousin. I put up the ceramic tree Mom had lovingly made years ago, which definitely saved time but still gave the home a warm holiday feeling. I started buying gifts as I discovered them through the year instead of waiting to find “the perfect gift”. As a family caregiver you too can find a few ways to make the holidays a little easier. Maybe you can scale back your shopping, baking, and decorating expectations. A cookie exchange can be a help. Bake one type of cookie and have friends or family members bake others and share with each other. Get other family members or friends involved in decorating the house on a smaller scale. Your loved one gets to visit with all the family who come to help. This scaling- back can also be an unforeseen blessing for a loved one with dementia who might find lots of blinking lights and motion-activated decorations overstimulating. Gift cards and cash can help alleviate some of the shopping stress. How many times have you received a gift that does not fit you or your style and ends up in a closet or drawer? Do you know anyone that will turn down a gift card or a greeting card with a check or cash in it? Making just these small changes can put you on the road to a less stressful holiday season. Just remember, that if family can’t help with these preparations, St. John’s Community Care can. In the past St. John’s Caregivers have helped mix and bake Christmas cookies, cleaned homes before the holiday, and even put up and decorated the Christmas tree. If you want to go shopping, Caregivers can keep your loved one safe and warm at home while you are gone. St. John’s Caregivers are also willing to come in and cook the turkey and trimmings a day or two ahead, using your family recipes, so all that’s left for you is to warm it up and enjoy the good feelings of the holiday season. Call 344-5008 to discuss how St. John’s can help lessen the holiday stress for you and your loved one.